This recap was written and submitted by the lovely Asti from A Bookish Heart. Ismae is raised to serve the patron saint of Death, Mortain, by assassinating those he marks. After a meeting with the abbess at her convent and Chancellor Crunard, she is assigned to spy on Duval and make sure he is not betraying the duchess. Ismae does as she is told, but ends up falling in love with Duval. This makes it hard when she later receives a message from the abbess to kill Duval after the abbess has received a letter from Chancellor Crunard that Duval has been plotting treason with his mother and has been behind many of the issues the duchess has faced. Ismae realizes that Chancellor Crunard is the bad cookie in this bunch that is truly causing the problem and using his influence to get the convent to work in his favor. He even poisoned Duval! Ismae ends up capturing Chancellor Crunard, healing Duval, and decides the convent isn’t necessarily where her future lies. Ismae is rescued from her horrible past with an abusive father and creepy new husband and taken to the abbess of Saint Mortain who teaches her how to be an expert assassin. For her first two tests, Ismae has to kill two separate men who seem to be working against the duchess. She kills both successfully, but this ends up enraging Duval who wanted to talk to these men to gather information. It is decided in a meeting between Chancellor Crunard, Duval, and the abbess that Ismae will accompany Duval to the high court as his “cousin” (aka mistress). That way she can give him a chance to interview anyone before she kills him, and also gives her a chance to spy on him to ensure he’s not a traitor. Duval and Ismae are attacked upon arrival at the high courts of Brittany. There are seven men waiting for them in an alley with poisoned blades, but they are no match. Duval and Ismae kill all but one for questioning. As they continue into the city, Ismae spots Sybell but they do not talk. Duval and Ismae are at the high court when Duval is informed that the assassin they captured earlier has regained consciousness. Duval leaves Ismae behind, and she finds out that his family is plotting treason to get his brother Francois on the throne instead of the duchess. Duval later confirms this, but states that is why he is estranged from his family. Ismae also learns that the captured assassin was murdered by an unknown person before he could be questioned by Duval. Duval has private meeting with the duke of Nemours who wants to marry the duchess. This would solve the duchess’s problems since she needs troops to protect her country from France but does not want to marry the creepy old Count d’Albret. Unfortunately, shortly after discussing the marriage proposal with the Privy Council Nemours is murdered. While attending to the duchess, Ismae hears her fighting with Madame Dinan about marrying Count d’Albret. Madame Dinan leaves the room and Ismae stalks her and overhears her assuring Count d’Albret that she is loyal to him and that they will sort something out. They sorted something out alright. Madame Dinan left the duchess in a hallway alone with Count d’Albret and he put his hands all over her. Luckily, Ismae received a note from Sybella that put her in the area at that time and she was able to stop him from doing any major damage. At a celebratory dinner, an assassination attempt takes place on the duchess which is only stopped by Ismae’s quick thinking. Ismae’s identity is revealed to those of the Privy Council who are outraged. They decide Duval is to blame for all the problems the duchess has run into since he has influenced her to make many of the decisions she has. Duval has to go into hiding behind the walls of the castle to escape arrest. Ismae gets orders from convent to kill Duval’s mom, Hivern, for plotting against the duchess. Ismae plans on doing so with a poisonous candle, but changes her mind while completing the act as she pities his mother. Instead, she convinces Hivern and her other son Francois to swear an oath of fealty to the duchess. At night, Duval sneaks into Ismae’s chambers and she can tell he has been poisoned but is not sure by who or what. She realizes that the only person who has had access to her poisoning kit is Chancellor Crunard. Ismae cannot do anything about it though because she has not antidote and has to leave Duval behind to accompany the duchess to Rennes away from invading troops sent by d’Albret who is angry about her not marrying him. Once at Rennes, Ismae is tipped off by Sybella that they have walked into a trap. She manages to help the duchess escape to reinforcements. Afterwards she walks through the battlefield and uses her misericorde to release the souls of those dying. 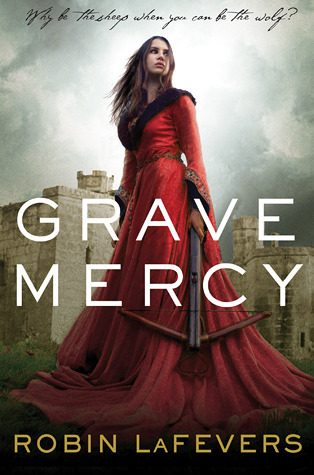 Ismae realizes she wants to serve Mortain’s mercy, not his wrath. She sees him there on the field and he helps her realize the true potential of all her gifts. Once Duval and Ismae recover from their… healing, they go to exit the hidden chamber they were in and find Chancellor Crunard waiting for them with a crossbow. Chancellor Crunard only spots Duval though, and asks him to play a game of chess with him. Ismae realizes that Duval was being poisoned by Chancellor Crunard through a chess piece he was carrying everywhere with him. She longs to kill Chancellor Crunard, but instead knocks him unconscious. After everything is sorted, Ismae returns to her own rooms later to find the abbess waiting for her. The abbess is angry with Ismae’s defiance and is also jealous that Ismae had seen Mortain. Ismae informs the abbess that she wants to serve Mortain differently now, and is not sure what her future holds. The book ends with the duchess finally turning old enough to accept her duchy. Duval proposes to Ismae, and tells him that whenever she is ready his heart is hers. Misericorde – Mortain’s dagger carried by full initiates of the convent. If it makes contact with a living man, it releases the soul from the body. BLESS YOU. I just picked up Dark Triumph and after 2 pages I had to give up because I had forgotten everything except that Duval was cute. Now I can read it! Don’t forget Crunard’s motive–his poor son! Omg yessss she sexes the poison right out of him. I was into it. I just started Dark Triumph this morning and had forgotten all of this so THANK YOU! The beginning makes so much more sense now.